Time Out Market Miami, the food and cultural market based on editorial curation, today revealed the latest additions to its line-up of chefs and restaurateurs ahead of its opening this year. The city’s most celebrated culinary talent such as James Beard Award winning Chef Norman Van Aken, Antonio Bachour, Giorgio Rapicavoli and Suzy Batlle of Azucar will join previously announced top chefs such as Jeremy Ford, Michael Beltran and Alberto Cabrera. 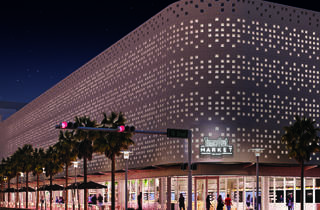 Located at 1601 Drexel Avenue, just off Miami Beach’s Lincoln Road, Time Out Market will bring the best of the city together under one roof: its best restaurants, bars and cultural experiences. Here are the latest additions to the curated mix of 17 kitchens at Time Out Market Miami, offering an incredible range of local high-quality food, affordable and accessible for all. The impressive line-up includes award-winning chefs, much-loved local talent and popular restaurateurs who will bring Miami’s exciting food scene to Time Out Market. NORMAN VAN AKEN: Chef Norman Van Aken is best known for introducing ‘fusion’ into the lexicon of modern cookery and is considered to be the founding father of New World Cuisine. At Time Out Market Miami – his first foray into a food and cultural market – his concept "K'West" will present a menu that delivers the remarkable taste of South Florida and the Keys. The menu will feature his Ceviche of Gulf Shrimp with Charred Peppers & Chillies in ‘Salsa of Life’; Rhum & Pepper Painted Fish with Mango Mojo and Mariquitas; BBQ Duck Meat Balls with Boniato Mash, and in homage to his long-time home of Key West, Bahama Village-Style Key Lime Pie. One of Miami’s top culinary masters, Van Aken has a vast list of accolades. He is the only Florida chef inducted into the prestigious James Beard Foundation’s list of ‘Who’s Who of Food & Beverage’ (2003) and is also the recipient of their ‘Best Chef Southeast’ (1997) award. He has been nominated four additional times by the Foundation for his culinary excellence; has penned six cookbooks and a memoir; and in 2016 was inducted into the MenuMasters Hall of Fame alongside Jacques Pépin and Wolfgang Puck. ANTONIO BACHOUR: Recipient of the 2018 ‘best pastry chef award’ at the Best Chef Awards in Milan, Italy, Antonio Bachour will satisfy every sweet tooth at Time Out Market Miami, serving patisserie and confections that are equally as delectable as they are beautifully artistic masterpieces. Born in Puerto Rico, he developed a passion for his craft in his family’s bakery before moving to Miami Beach in 2000. He has worked in some of the city’s most prestigious kitchens, receiving a small army of awards and earning some of the highest culinary honors. His dedication, creativity and meticulous approach has earned him a reputation as one of the greatest pastry chefs in the world. GIORGIO RAPICAVOLI: The incredibly talented Giorgio Rapicavoli will offer guests at Time Out Market Miami a taste of the artfully presented dishes that made his restaurant, Eating House, an instant success and local favorite since it opened in 2012 (when he was only 26). Long-time fans will also be eager to sample his latest inventions comprised of Italian dishes that take inspiration from his family roots, as well as from his time spent cooking at the University of Gastronomic Sciences in Italy. Dishes served at Time Out Market will include Pasta Carbonara, Oyster Mushroom Anticucho and Cauliflower Elote. Giorgio’s list of accolades includes the prestigious Forbes ‘30 Under 30’ for food list, a James Beard Award nomination for Rising Star Chef and he took home the top prize on the Food Network’s show Chopped. LOVE LIFE CAFE: Partners in both love and life, Veronica Menin and Diego Tosoni will bring their plant-based Love Life Cafe to Time Out Market Miami. With a passion to run a conscious business that makes a difference in the world, they opened Love Life Cafe in 2015. It is all about clean and fresh food without sacrificing a delicious, indulgent dining experience full of flavor. At Time Out Market, the couple will feature their best-selling and much-loved dishes including salads, smoothies and their award-winning veggie burger. AZUCAR: Suzy Batlle went from full-time banker to creator of Miami’s legendary creamery Azucar in the heart of Little Havana. Now, the Queen of Cuban ice cream will bring the city’s most talked about shop to Time Out Market Miami, serving her most popular flavors, including the trademarked Abuela Maria with vanilla, guava, cream cheese and Maria crackers. Taking after her grandmother, who prided herself on inventing unique flavors using the region’s exotic fruits, Suzy will also create new custom flavors for Time Out Market to surprise her loyal fans and new visitors. SALT & BRINE: Christian and Dominica Plotczyk, who redefined Miami’s oyster scene with Ella’s Oyster Bar, will introduce Salt & Brine at Time Out Market Miami. This raw bar will be fun, not traditional—it will feature a curated list of oysters, brought in fresh each day and shucked in front of the guests, making the enhancements the star of the show. Oysters can be topped with Miso Ponzu, Yuzu Mignonette, Atomic Cocktail Sauce, Hot Winter Melon Spice, Wasabi Tobiko and more. In addition to the oysters, the Salt & Brine menu will include Lobster Rolls, Crab Buns and Shrimp Cocktails. PHUC YEA: Partners Chef Cesar Zapata and Aniece Meinhold will bring their beloved Viet-Cajun spot Phuc Yea to Time Out Market Miami. The restaurant’s unique spin on traditional Asian blends Vietnamese cuisine and New Orleans’ style Cajun fare to bring forth something truly unique. Phuc Yea has grown a devout local following from its humble beginnings as Miami’s first pop-up restaurant in 2011, and later opening a permanent location in MiMo, one of the city’s up-and-coming neighborhoods. At Time Out Market, the duo will present dishes such as Pho Mi Sobe served with Hanoi Lemongrass Chicken, Buns with Salt n Peppa Crispy Tofu and Texas Style Smoked Brisket. WABI SABI BY SHUJI: Wabi Sabi is named after the Japanese philosophy centered on accepting the imperfection in beauty. Chef Shuji Hiyakawa, who grew up inside his father’s Udon noodle shop in Japan, is now introducing to Miami the most authentic, yet simple Japanese sushi bowls. At Time Out Market Miami, Chef Shuji will compress his three decades’ worth of experience in Japanese fine dining into five signature dishes focused on quality and flawless execution. Diners will be able to customize their experience, with the option to select various bases and sauces. “We are very proud to reveal the latest additions to our line-up for Time Out Market Miami. The curated mix of chefs and restaurateurs who will join when we open is the who’s who of Miami’s culinary talent. Time Out Market will be a place where they can showcase their outstanding creativity and skills and where our guests will get to enjoy the city’s best food. For fifty years, Time Out editors have been writing about the best food, drink and cultural experiences to help people make the most of the city; today, a global team of local expert journalists is curating the best things to do in 315 cities in 58 countries across websites, magazines, social media, live events and now also Time Out Market. In 2014, the editorial team behind Time Out Lisbon turned a historic market building in the city into Time Out Market Lisbon, the world’s first food and cultural market based wholly on editorial curation. Today, it is the most popular attraction in the country with 3.6 million visitors in 2017. In 2019, this successful format will expand globally with new Time Out Markets also opening in New York, Boston, Chicago and Montreal. 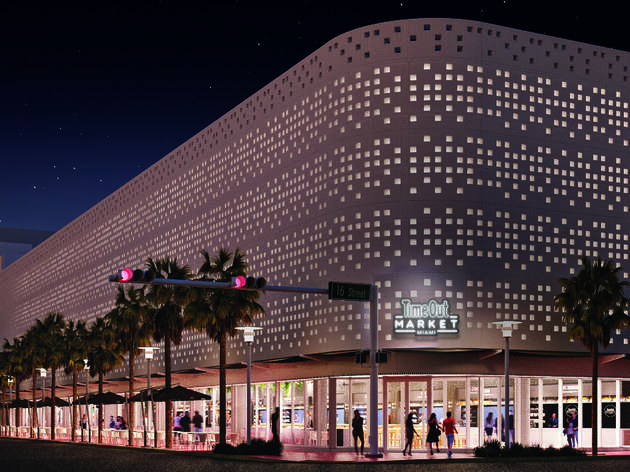 Across 17,500 sq ft, Time Out Market Miami will feature 17 kitchens, a demonstration kitchen, three bars offering cocktails from award-winning mixologists and an art space showcasing stunning art works by rising talent. After exploring and sampling a variety of dishes—served on chinaware with flatware—from the surrounding kitchens, family and friends come together to enjoy their meals at communal tables in the center of Time Out Market. The average food check per person for dinner will be approximately $20 and cocktails will be available from $13. Jeremy Ford: The critically acclaimed winner of Top Chef Season 13, will bring his interpretation of Korean flavors to Time Out Market Miami. Diners can expect exceptional, artistic dishes with intense and delicious flavors known from his celebrated Stubborn Seed in Miami South Beach. Michael Beltran: Chef of the Year nominee and recipient of Restaurant of the Year for Ariete, will present Leña, a meat concept at Time Out Market. On the menu: ‘smoked short rib with grilled escarole’, ‘smoked half chicken with grilled fennel and orange’ and more. Alberto Cabrera will helm The Local Cuban at Time Out Market, a concept inspired by the time he spent in the kitchen with his family as a child. He will serve his award-winning Cuban sandwich, ‘media noche croquetas’ and more. KUSH by Matt Kuscher will offer his epicurean, American cuisine based on locally sourced ingredients. Coyo Taco chef Scott Linquist will serve his hugely popular tacos made with locally sourced vegetables, seafood and humanely raised meats. 33 Kitchen by Chef Sebastian Fernandez, named Best Peruvian Restaurant in Miami in 2016, will serve ethnic-inspired dishes that combine modern techniques with pristine ingredients like ‘tuna tiraditos’ and ‘ceviche de corvina’. Miami Smokers: An urban smokehouse started by Andres Barrientos and James Bowers, will debut its first charcuterie bar, serving a selection of whole hog cured meats. Stephen’s Deli: A spin-off of Miami’s oldest and only New York style deli since 1954, will be the second Time Out Market Miami locale for Matt Kuscher.